What sort of blog post should an author make? John Locke in his book How I Sold 1 Million eBooks in 5 Months! suggested that the best method an author could use to use blogging to promote a book was not to write about the book itself but to produce a blog post designed to go viral and which contains subtle links which encourage the reader to find out about your book. Although John is in ‘author disgrace’ over the paid for review issue, he’s spot on with his approach to blogging. John wrote a post Why I Love Joe Paterno and my Mom! in which he blogged about how his mother encouraged him to find a role model, his choice being Joe Paterno, a longtime football coach at Penn State. The blog makes only a minor reference to John being an author but is hosted on his website where his audience can read more about his work. John promoted the blog by sending the link to it to Penn State University related bulletin boards, blogs and people tweeting about PSU. It quickly went viral, being read not just by football fans. Part of its attraction was his choice of title – we may not all know Joe Paterno but we all have a mother. The post was made before the Penn State scandal became an issue. John doesn’t post often. Each blog is very carefully planned and aims to tug at the heartstrings. He did it again with a post ‘Fathers and Daughters‘ in August 2012. Sooner or later someone will use a bioterrorism technique to release a pandemic which actually helps people! It could be that the common cold is it’s first target. Everyone knows how easy it is to catch a cold but there are some things about the process that aren’t common knowledge. Let’s try an experiment. While you read this don’t touch your eyes! Imagine someone with a cold gets in a lift. They sneeze and a fine mist of spray spreads everywhere. It quickly settles though. They get to their floor and exit the lift. You call the lift from two floors down and the first thing you do when you get in is to press the button to select your floor. A button covered by a fine spray of cold virus. So now you have the cold virus on your finger. Not a big problem, it’s unlikely to get through the skin on your finger. Of course you could infect yourself with a cold by now eating something. Touched or want to touch your eyes yet? As you’ve probably found out by now, we touch our eyes all the time and as soon as you do, that virus finds a warm, moist very thin membrane and promptly infects you. Ever noticed how a cold can make your eyes sore? Now imagine a terrorist intent on using biological warfare. A good way to spread contagion would be to spread their substance on anything which people frequently touch. Lift buttons, push plates on doors, door handles, shopping cart handles, magazines in a shop, newspapers and books in a library. Money! Forget the idea of sending letters. There are a huge number of ways of spreading any virus using things we touch. Now imagine a genetic researcher who has made a fantastic discovery. He/she has come up with a genetic fix which will forever stop people from catching the common cold. Would you buy it assuming it’s 100% safe and costs little? Of course you would! So if this had been produced do you think you would get the opportunity? Frankly you would have as much chance as a celluloid cat being chased by an asbestos dog through the fires of Hell! The answer is simple. The people who would be marketing this are the very people who make a fortune every year by selling cold remedies. Are they ever going to willingly give up those billions of dollars of regular income? Fill the glass with hot water, stir well and drink. Go to bed with a good book and relax or sleep it off. If you find your symptoms are not better after an hour or so repeat. Now I know what some of you are going to say. “I don’t like whiskey,” but believe me – this tastes nothing like it. It tastes good, relieves a sore throat, relieves congestion and after three of them you won’t care about the cold! OK – free advice over; now let’s consider something else. During the course of researching our ‘A Vested Interest’ books I had occasion to investigate gene therapy. 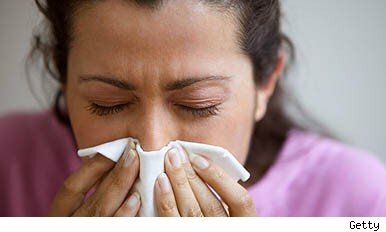 It is possible to alter a virus so that it inserts the genes which prevent a cold. Imagine a genetic researcher has produced that cold cure. It really works and he knows it’s safe. But he/she can’t market it for the reasons explained above. He/she can’t announce it either without putting their life at risk. There’s a multi-billion dollar industry at stake here remember? The researcher knows the people of the world want the cure though. Does that researcher have the right to deny them it? Should they risk the wrath of the drug companies to make it available? I think you’ll find that the researcher would adopt the bio-terrorist tactics to release his/her product. Sooner or later some well meaning person will do this! So how did my post do? Well I followed the John Locke formula and wrote a post which replaced the common to all factor of ‘Mum’ with ‘Cold’ – something we’ve all gone through the misery of. Like John I made a subtle reference to being an author and didn’t over emphasise ‘the book’. I used a buzzword ‘Bio-terrorism’ instead of ‘Joe Paterno’ which played on media fear factor rather than hero worship. I even got some well known authors, including John Locke, adding comments – which I responded to. You can see the original post and comments here. My post didn’t go viral however. John Locke’s Joe Paterno post had 100s of comments and mine had 10. Where I failed was in promoting the blog. I failed to use Twitter effectively. At the time John made his post he had 1000s of Twitter followers whereas I, was new to Twitter, had only 200 followers and didn’t know about hashtags or searching Twitter. I didn’t know about Triberr either and wasted the opportunity to have it promoted there. My blog was hosted at blogspot rather than at my own domain and in the original post I didn’t have links to my site. My post was better than John’s! In three areas my blog post was better than John’s. I included a graphic. People like pictures – they are attention grabbers. Use relevant pictures! I used lots of sub-headings. Subheadings allow the reader to quickly skim an article to see if it’s what they are really interested in without having to read the whole thing. I used the Associated Press style of writing in that I started with a quick synopsis and then went into more detail section by section. Write about a blog subject which you know well and which you feel others should know about. Don’t write ‘Buy my book’ blog posts. Reading those is as popular as sitting down to watch just the adverts on TV. Include subtle references to your author craft and books. Give the reader the opportunity to find out more if they wish. Use pictures and break your blog down with subheadings. Unless you have a massive blog following already, you are probably wasting your time if you don’t have a good understanding of how to use Twitter and Triberr to promote your posts. Seek out those who have blogged, discussed and tweeted about similar subjects and make them aware of the link to your post. Don’t be afraid of posting to other authors. Authors are usually prolific readers – I read 64 books last year just on my Kindle. Your aim is for the post to go viral! If it does people will want more and, the more they see your name, the more likely they are to buy your books. Yes I have #9. Finish with a question which invites comments. Feel free to comment – If you know of any other technique to promote your book through blogging which I haven’t included, please feel free to add it..
You have laid out a good roadmap. Good Advice! I have never heard of Triberr.